In today’s workforce, industrial/organizational (I/O) psychologists are becoming increasingly valued and instrumental in advancing organizational effectiveness. According to the U.S. Department of Labor, the field of industrial/organizational psychology will enjoy a 26% growth in employment through 2022. Detroit Mercy's 33-credit (11 course) evening program focuses on theory for application and professional practice and can be completed in one academic year. It prepares students to perform quality professional services in a variety of workplace settings, including human resources, organizational culture and development, talent management, leadership development and workforce analytics and research across any industry and organizational type. 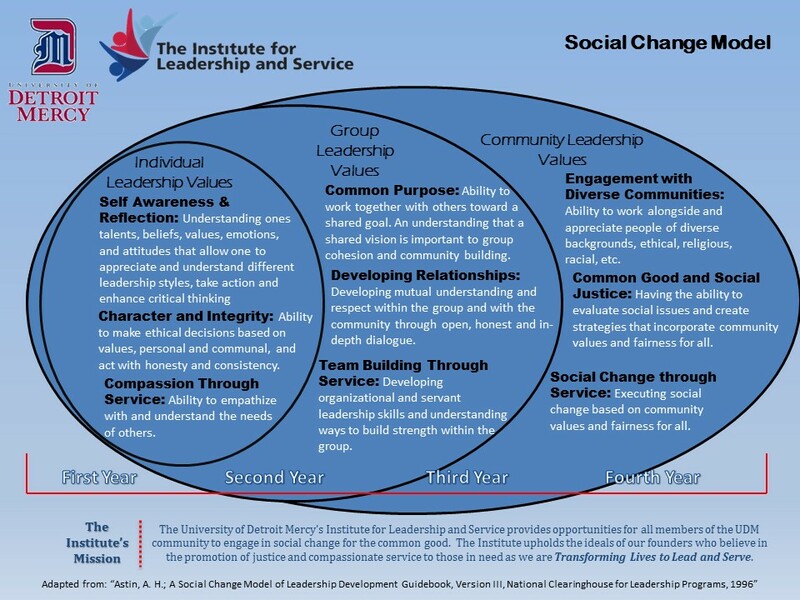 The program equips students with competencies outlined by the Society of Industrial/Organizational Psychology (SIOP) and by the University Detroit Mercy Social Change Model. It also provides career advancement, professional development, as well as entry-level opportunities in private, non-profit and public sector organizations. As southeastern Michigan’s longest running terminal master’s degree program, this highly specialized and competitive educational and practical experience in I/O psychology is distinct from graduate business education (MBA) and from doctoral training in I/O psychology. Although a very small number of students later go on to pursue doctoral degrees, the intent of the program is career-related employment upon graduation. Students engage in managing, leading, enhancing, assessing and evaluating these programs and utilize a variety of industrial/organizational psychology skills to enhance organizational growth and effectiveness. Students have also conducted and/or created job analysis, surveys, training modules, assessment tools, onboarding programs, training manuals, databases, formal presentations and other industry deliverables that can be shared with future employers in their growing work portfolios. In addition, three of the courses include service learning which allows students to live the Detroit Mercy mission and vision, while contributing to their practical experience and meeting the needs of other University units (human resources, programs, services, etc. ), grants or neighboring communities and non-profit organizations. All students provide a professional presentation to their program peers and prospective students describing their internship experiences and gained competencies. Students may attend either full-time (three or four courses per semester) or part-time (two courses per semester). Courses are offered exclusively in the evening and several courses are partially on-line to allow students to engage in either intensive studies, full- or part-time employment or graduate research and program assistant positions while in the program. Full-time students complete the program in one academic year, taking four courses in the fall semester, four courses in the winter semester, and three courses during the summer semester (May and June). The program includes a comprehensive examination and a 250-hour internship/practicum experience. The internship/practicum consists of paid and/or unpaid supervised practice of industrial/organizational psychology in a private, non-profit or public-sector organization. Paralleling the internship/practicum experience is a capstone course. This course allows for the synthesis of courses taken throughout the program, focuses on career development and professionalization and the reflection and integration of the internship experience with psychological theory and practice. Beginning in fall 2019, the Master of Arts with a major in Industrial/Organizational Psychology requires 33 credit hours, which can be completed in one academic year if the student attends full time. Please contact the program director to learn more about the revised curriculum: i-o-psychology@udmercy.edu. Included within the 33 credits are a comprehensive examination and a 250-hour internship. The required comprehensive examination is provided for students to demonstrate their knowledge and integration of theory, research, and practice. The comprehensive exam is completed by students as the final exam in the Capstone Experience. The internship/practicum experience requires students to complete 250 hours of paid (internship) or unpaid (practicum) work on at least two projects in selected organizations, which serve as the internship/practicum site. The projects may consist of assessing, analyzing or appraising performance, aptitudes, skills, preferences, needs, or personality factors required for job/task analysis, personnel recruitment, selection and placement, or performance evaluation, etc. Accordingly, students manage projects and programs, execute consultation engagements, and/or design pertinent descriptive or evaluative investigations, collect data and perform appropriate statistical analyses. A formal internship arranged by the University and/or the student. An internship at a student's current place of employment, provided that they are supervised by someone other than their regular supervisor in an another department and doing I/O related projects other than or in addition to their regular work responsibilities. A brand-new employment opportunity that utilizes a student's growing I/O skills. Students are encouraged to seek out placements at existing sites in the program database and are also permitted to explore placement opportunities with new sites locally, regionally, or nationally that meet student’s career, industry, and geographic aspirations. Students create a list of these aspirations, as well as specific learning objectives for their internship/practicum experience. These documents insure customizable, desirable and appropriate placements for each individual in the program. Requirements for internship/practicum sites are provided in the Program Handbook and the Internship course syllabi for admitted students. The Detroit Mercy program accepts both full- and part-time students. All courses are offered in the evenings and some are partially online. The application deadline is March 15 for admission for the following fall semester. However, all applicants are encouraged to submit materials and applications early. Group information and application interviews are typically scheduled for the third or fourth week of March. If opportunities are still available, additional interviews are held during the third week of April. Once capacity has been reached for the fall admissions cycle, eligible and selected applicants will be placed on a waiting list. The program begins each fall. Applications may be submitted up to one year prior to the start of the program and no later than August 5. A baccalaureate degree from an accredited college or university, with a 3.0 grade point average in the last two years (official transcripts). An exception may be made to this requirement if applicants can demonstrate exceptional promise in some other way. Completion of an undergraduate major in psychology or a major in a related field with required undergraduate prerequisite courses (typically this includes Introduction to Psychology, Research Methods, and Statistics. However, other Psychology and Business courses will be considered). Scores from the Graduate Record Examination, General Aptitude Test (the Psychology subject test is not required). Minimum combined score (V & Q) of 800; 1000 or greater preferred; *Note: Detroit Mercy undergraduates are encouraged, but not required to submit GRE scores. Three letters of recommendation from professors or colleagues. *Note: Detroit Mercy undergraduates are only required to submit two letters of recommendation. A one to two page personal statement addressing the following items: how your personal, academic and/or professional career has prepared you for graduate study, your career interests, and how Detroit Mercy’s I/O psychology MA program will allow you to accomplish your personal and career goals. An admission interview is also required. The interview’s purposes are: (a) to enable the faculty to become better acquainted with prospective students (e.g., to assess communication skills and career goals in relation to the program), and (b) to permit applicants to become more familiar with the program and its potential contributions to their careers. This interview begins with a realistic job preview approach which includes a group interview with the program director and current I/O psychology graduate students. Then, each prospective student meets with the program director individually receive a campus tour by current students. The realistic job preview approach improve selection decisions, student retention and applicant choice satisfaction. The faculty make admission decisions shortly following the interview to allow timely decision making and for accepted student participation in the required program orientation and mentor matching in May/June. Earlier admission is best for obtaining research and teaching assistant positions which involve working directly with faculty and affiliated University programs. Interviews for these positions are only for accepted and committed students and typically occur in April. Students must maintain an overall GPA of 3.0. A student who earns two grades of C+ or lower will not be eligible to continue in the program unless the student can demonstrate unusual or extraordinary circumstances as responsible for the deficient performance. Graduate students are eligible for several financial aid programs funded by the federal government and the State of Michigan. For more information, please contact the University of Detroit Mercy Financial Aid Office at 313-993-3350. Applicants are encouraged to submit the Free Application for Federal Student Aid (FAFSA®) as soon as possible and prior to the assistantship interviews in April to determine their eligibility for Graduate Work Study and field experience positions. The program offers several opportunities to support your educational endeavor with research and teaching assistantships. These opportunities vary from year to year and require a separate interview. Many involve working with the Institute for Leadership and Service (ILS). Previous responsibilities have included coordinators of the following programs: Emerging Leaders Program, Step Up: Be a Leader and Pay it Forward, Treo Upward Bound, Ford Community Corps Partnership, ILS Research, Assessment and Evaluation, I/O Program Research, Assessment, and Program Management. Students are paid via Work Study, research and programming grant funds, and/or tuition remission stipends. Students are encouraged to consider additional coursework to enhance their Master of Arts with a major in Industrial/Organizational Psychology. Please speak with your advisor about opportunities within the College of Business Administration and the College of Engineering & Science.